What do I have in common with Dita Von Teese? Soon, I’ll have what she have. Um, I mean the shoes. Can’t wait for you Melissa x JPG! Heart! Little did I know when I first choose the nickname deszell for mIRC, I will be sticking with it, maybe, for the rest of my life. The only thing constant in my life since my 17th birthday is perhaps the name that I’ve claimed as mine – deszell. I don’t think you can’t anymore separate this identity from me. Years ago, I have my own reason to stay with the name deszell online, just because I want to separate the professional life to my passion. I roam the www as deszell in search for information related to beauty, music, and god knows what in between those two. And now, I stay with that name, just because people probably search my articles through my nickname and not my real name. And because, my nickname and my real name have become one. I trust people don’t question who deszell in real life anymore. At least, those who know me in virtual world as deszell know who I am in the real world. But probably not vice versa. And 13 years have passed, and I still love the name. 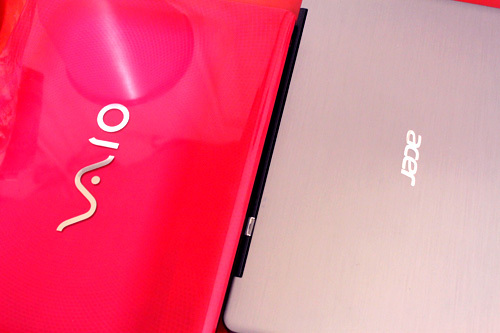 I’m currently using both my Sony VAIO E Series and Acer Ultrabook. Talking about having the best of both worlds! I can’t seems to let go my Sony VAIO, I guess, I’ve grown accustom to the bounce of their keyboard that I type easily with it. This is my second VAIO, after my first one died on me after more or less 7 years of usage. On top of it, it has CD/DVD tray that allows me to transfer files from CD-ROM. And the screen is the perfect size for a work station. Whereas the Acer Ultrabook, it’s actually a full blown laptop where you can actually do your work with it, but it’s so lightweight, I don’t have to stress myself out whenever I have to bring it on my bag the whole day. I don’t have to think about changing into a bigger bag, because it’s so thin and it’s A4 paper in size. So, my normal bag should be able to accommodate this baby. The battery runs for about 4 hours, so if I don’t plan on using it the whole day, just in between my meetings and events, I don’t usually bring its adaptor. And, even if I have to carry it as is, without any sleeve or bag, it looks ever so stylish in its sleek silver body. I really love this laptop dearly 🙂 Making working on the go so much easier. Both runs on Intel i3 processor, which though isn’t i5, I don’t find them to be any disadvantage at all. Because they’re quite fast already, even when I open multiple windows on my laptop as well as my Photoshop. They’re still hanging there pretty strong. There are actually couple of apps that you can download to make your life easier if you’re working with two laptops, I’ll save that post for FD.